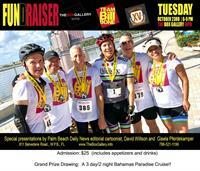 Please join us at The Box Gallery on Tuesday October 23rd from 6-9pm as we support the Team Bill Bone cycling team in their charity ride from Miami to Key West in November. Admission: $25--include appetizers and drinks. Grand prize raffle drawing for a 3 day/2night Bahamas Paradise Cruise.